ST. PAUL, Minn. – The shaking, the swaying, things falling and there is nowhere to go. It happens without warning and it often affects large areas. There are few natural disasters more devastating in terms of potential loss of human life and property damage than earthquakes. Moreover, after the shock wears off, an earthquake’s aftermath presents serious hazardous conditions to both victims and rescue workers, the most serious of which oftentimes is working in and around collapsed structures. Selection of appropriate safety equipment, including personal protective equipment (PPE), is critical to all rescue workers, law enforcement, and other professionals involved in the aftermath. For professional workers falling under the scope of the Occupational Safety and Health Administration (OSHA) or any another regulatory body, specific requirements apply when using PPE. If questions arise concerning the proper use of PPE, users should contact their supervisor (if occupational use) and refer to the product User Instructions, or contact the manufacturer directly. Earthquakes can present logistical challenges affecting initial response and recovery. These may include loss of electrical power, poor communication capabilities and interrupted or compromised water supply. Addressing these needs quickly will facilitate response efforts and the ability to protect the health and safety of response workers. Numerous hazards are present during the initial earthquake response and subsequent recovery and clean-up efforts. Excessive noise during operation of heavy equipment, generators, power tools, etc. A hazard assessment completed by a qualified health and safety professional is recommended prior to entering any response area presenting an adverse exposure risk. For collapsed or heavily damaged building structures, an inspection by a professional engineer should be completed prior to entry. Efforts should be made to brace or shore building walls and floors which have been damaged, when possible. In many cases, time constraints and limited resources may present obstacles to response workers, particularly when additional loss of human life is possible. Appropriate selection of personal protective equipment (PPE) and other safety equipment is critical to help control recognized hazards. 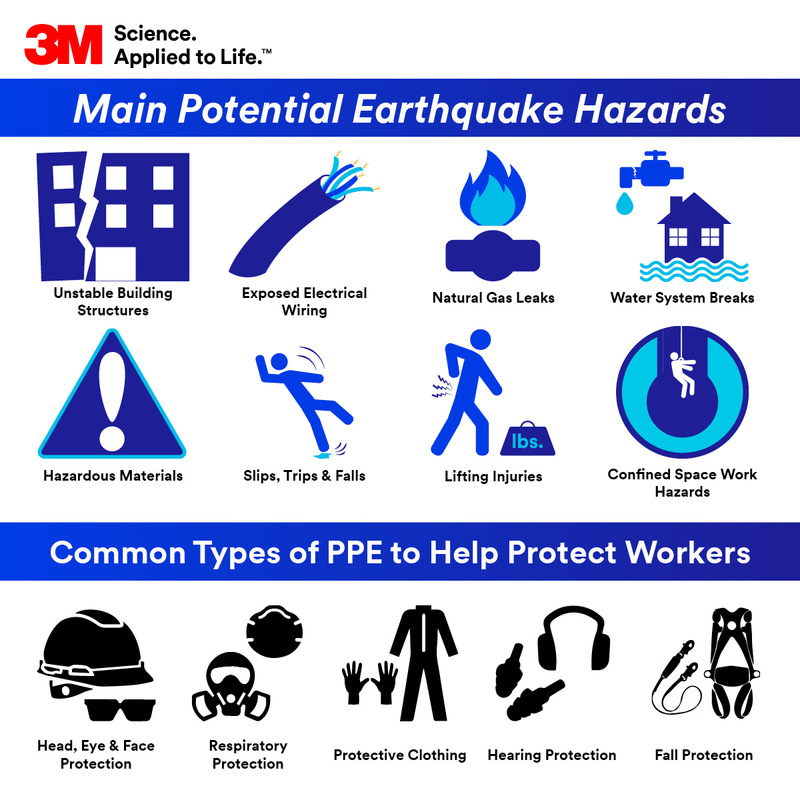 The following describes the general types of PPE that are commonly applicable to earthquake response, recovery and clean-up. Head, eye and face protection can help reduce the risk of injury due to falling or flying debris, or airborne dusts that are commonly part of the rubble you may encounter when navigating the cleanup area after an earthquake. Hard hats should meet the requirements of ANSI Standard Z89.1. Look for a sticker or markings on the inside of the hard hat indicating that it meets this standard. The sticker or markings will also state the type and class of hard hat. The type and class of hard hat needed will depend on the anticipated hazards present at the site. Eye and face protection may also include safety glasses or goggles and face shields. Use of safety glasses with side shields should be considered minimum protection at all natural disaster sites. Unvented or indirectly vented safety goggles may be used for dusty environments or situations where splashing can occur, and may fit over prescription eyewear. Safety glasses with a foam seal around the lens area forming a partial seal are also suitable for dusty environments or for environments where minor debris may be falling or floating in the air. Protective eyewear should meet the requirements of the American National Standards Institute (ANSI) Standard Z87.1 for safety eyewear. As per Z87.1-2015 requirements, impact rated eyewear will be marked “+” or “Z87+”. Protective eyewear will be marked “D3” when designed splash protection and D4 for dust protection. Face shields are considered supplemental protection and should be used only in combination with approved safety glasses or goggles. Hearing protection is usually necessary when operating heavy machinery or power tools. Both earplugs and earmuffs are available. Comfort is also an important factor to consider. If the HPDs are comfortable, they are more likely to be worn and to be worn correctly. Likewise, the hearing protectors must be compatible with the other gear that needs to be worn during a natural disaster response. Hearing protectors are available that physically connect to portable radio systems, or provide all-in-one, fully contained wireless protective communication solutions. Level-dependent environmental microphones are also available to help wearers maintain important situational awareness and face-to-face communications, while still protecting them from harmful noise levels. Respiratory protection may be needed in all phases of natural disaster response. Appropriate selection is needed to assure the correct respirator is being worn for the work environment. In certain situations, the site may present inhalation exposure risk to unknown contaminants. Entry into these areas should be prohibited until adequately characterized. All respirators used should be tested and certified by the National Institute for Occupational Safety and Health (NIOSH). When selecting a respirator for particulate hazards, a disposable respirator or reusable half/full facepiece with a minimum 95 class particulate filter (e.g., N95, R95, P95) is suitable for most types of dusts. Particulate respirators/filters with an N95, R95 or P95 rating offer a minimum 95% filtration efficiency. For gases and vapors, a reusable respirator with an appropriate cartridge is needed, depending on the specific contaminant. A higher level of respiratory protection, such as a full facepiece respirator, or Powered Air Purifying Respirator (PAPR) may be needed for certain tasks, such as clean-up in buildings/homes that may contain lead, asbestos, PCB’s and heavy mold contamination. OSHA requires specific respirator selection requirements for lead and asbestos. The US Environmental Protection Agency (EPA) offers guidance in respirator selection for mold. Respirators must be used in accordance with the OSHA Respiratory Protection Standard, 29 CFR 1910.134. Mandatory use of respirators requires a written respiratory protection program established by the employer. Program elements include selection, employee training, fit testing, medical evaluations, maintenance and inspection, and record-keeping. Any air purifying respirator, which includes disposable, reusable half and full facepiece and PAPRs, should never be used in IDLH (immediately dangerous to life and health) environments. OSHA prohibits use of tight fitting respirators by anyone with facial hair. Refer to the OSHA website at www.osha.gov for a copy of 29 CFR 1910.134. Preventing skin contact, while maintaining durability and dryness. Heat and cold stress prevention. Worker visibility, particularly in high traffic or low visibility areas. Task specific protective clothing, such as welding and cutting. Follow the manufacturer’s recommendation for donning of protective clothing, gloves and boots to assure optimum fit, performance and comfort. Unlike other PPE that protect specific body areas (respiratory, hearing, head, eyes, hands, and feet), fall protection equipment is designed to help protect the whole body in the event of a fall. When selecting fall protection for a natural disaster application, careful consideration for the work environment is needed. 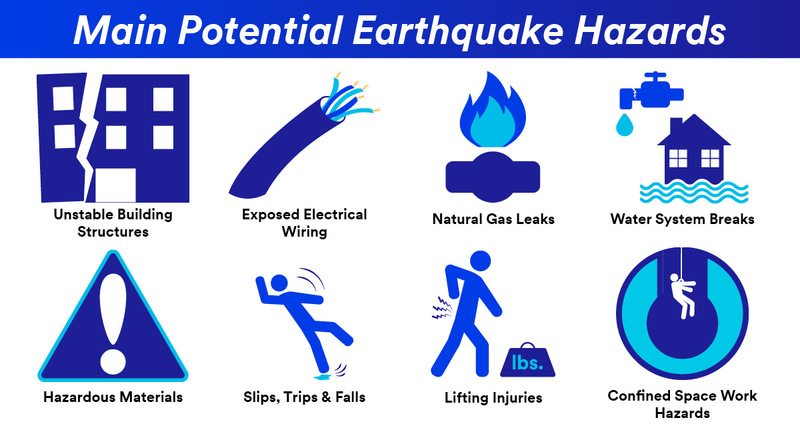 Hazards typically include unstable shifting materials, sharp edges, and numerous slip/trip/fall conditions when trying to navigate damaged buildings and structures that have been compromised due to an earthquake. Fall protection equipment commonly includes full body harnesses, connecting systems (lanyards and self-retracting devices) and anchorage devices. Confined space/rescue systems are often used with fall protection systems, and include a winch device to raise and lower, as well as a support structure. Use of these fall protection and confined space rescue devices requires specialized training that includes instruction on how to properly set up/install, use and maintain the equipment. OSHA regulations, such as, those relating to confined space, lockout/tagout, and fall protection may also identify other types of safety-related equipment that are required. OSHA fall protection regulations for General Industry, for example, have a 4-foot threshold. Some form of fall protection is needed whenever a fall of 4 feet or more is possible from a walking/working surfaces. Need to Order PPE or Have Questions About Protecting Yourself or Your Workers? We’re Here to Help. Pre-planning for personal protection is essential for earthquake cleanup. Having an understanding of the hazards involved when it comes to earthquake cleanup and the types of PPE available will help ensure worker safety is maintained. We invite you to download our earthquake cleanup infographic that outlines the hazards and PPE solutions as a quick resource to keep your PPE needs top of mind. For help selecting the right safety equipment and for more helpful information about how to deal with your area after an earthquake, please do not hesitate to contact one of our technical specialists at 1-800-243-4630 or download the tech data bulletin on tornado and earthquake cleanup.